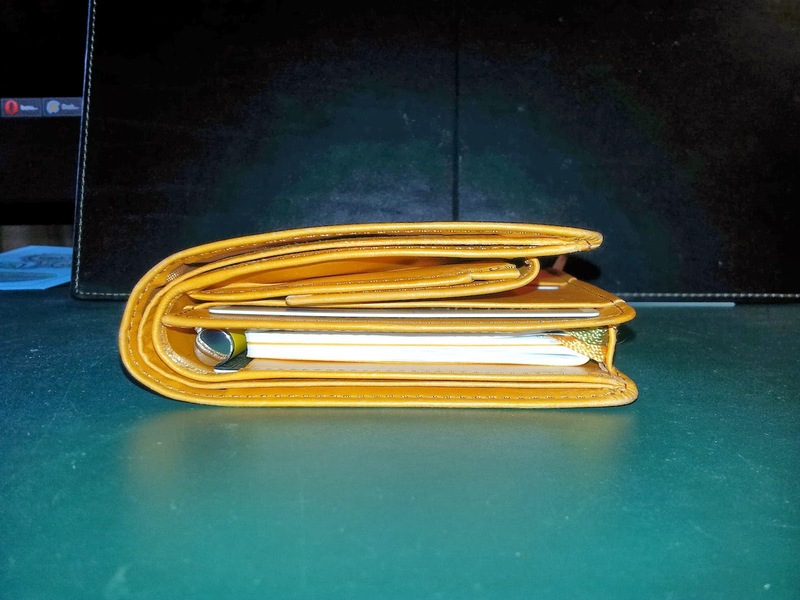 Plannerisms: Guest post: Review of the X47 DUO4 wallet. 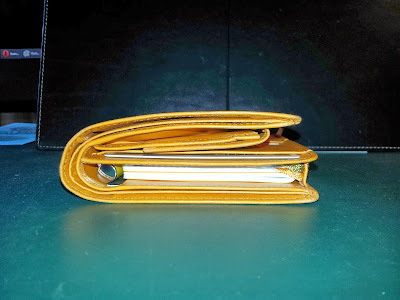 Guest post: Review of the X47 DUO4 wallet. Many thanks to Graham for this guest post detailing his experience with the X47 DUO4 wallet, which looks like a great way to combine your planner and wallet into one grab-and-go organzer! For me, a truly practical combination of a wallet and an organiser is the Holy Grail. 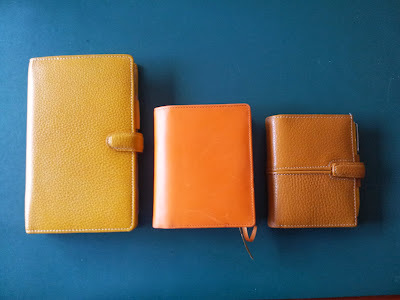 In the past, it has been organisers which have attempted to make themselves money friendly, with pockets for plastic cards and notes and zipped sections for coins. These additions have always felt like an afterthought, and I’ve never found them practical. One could never get to one’s money easily and efficiently, unattached papers would fall out and the whole process became a trial. The addition of cards and coins would make the organiser lumpy, making it less easy to write on. All in all, not a good marriage. So what about trying to make a wallet into an organiser? Enter X47’s Duo4. The Duo4 has been carefully designed to make a success of the wallet/organiser combination. It is slightly larger than a Filofax mini and has been cleverly designed to pack in features without wasting space. 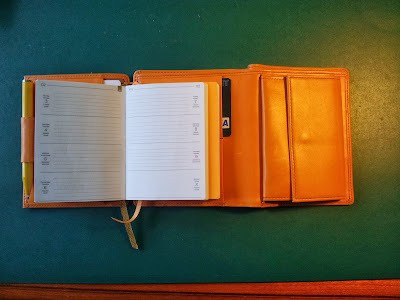 Plastic cards are stored in layers instead of overlapping each other, and, together with the high quality of the coin pocket, the Duo4 gets fatter as it fills but doesn’t bulge or get lumpy, which makes writing in the diary and notebook much easier than I had expected. There are no rings – an insert (about the size of those used in the Filofax mini format) fits neatly onto a steel spine, which makes using both sides of the pages very easy; and a pen (a Filofax mini pen fits perfectly) fits inside the unit and folds neatly around the insert, again making optimal use of the space. You can get a good idea of how the Duo4 has been designed by watching this video – it’s in German, but is also very instructive even if you don’t understand the audio. As a wallet I have no complaints about the Duo4, except that I would be nervous about carrying it in my back pocket for fear of bending the steel spines on which the inserts sit. Where the compromises have been made it’s been in the organiser, where the space saving theme is continued. The paper in the inserts is thin and the week on two pages diary split into two inserts each of 6 months. The amount of space to write for each day is limited – it could never replace the desk diary of a busy professional. I manage my to-dos on a computer so my inserts don’t include a section for those – if they did the amount of diary space for appointments would be reduced even more. To save space the month is written only as a number and public holiday names are, somewhat annoyingly, written in a page’s top margin rather than on the day itself. Also, when being used on the go, the organiser really needs to be placed on a surface as it would be very awkward to use it while held in the hand. I’m a great believer in customer service, but this was an area where I felt very let down by X47. Of the questions I sent before purchase, one was never answered and the others given a somewhat curt gruff response after 24 hours. This may be a language issue – X47 is a German company and haven’t fully or successfully embraced their international customers as yet – but when a product costs over EUR 200 queries should be answered quick sharp and in full. No excuses. These points aside, this is definitely the best wallet/organiser combination I’ve come across so far. Rene has one of these and it had really piqued my curiosity. Great to see it along size filofax binders for a bit of a better understanding of its size. I'm trying out a mini right now but might consider an X47 someday! 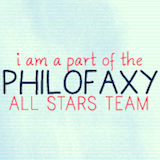 Wow thanks Markus for linking this post on X47's blog! Free For All Friday No. 21: Old or New? New Plannerisms Planners Facebook page! Free For All Friday No. 17: Planner excess?